The Ascended Masters appear to people in their meditations from time to time. It can be hard to determine who they are as google often produces conflicting images and unsatisfying results. And then the Masters themselves can be inconsistent in their appearances. Jesus can have light brown hair or black hair. He likes to mix it up. El Morya can appear as himself or as Abraham, one of his past lives. Archangel Michael actually has black hair, not the blonde he is often painted with. It can all be quite confusing. Below I’ve started to combine a list of those who stand out as different, have interesting features, are commonly seen or have identified their name and form to me. I will continue to update this list. Abraham – an incarnation of El Morya. He wears a white robe and has piercing blue eyes. His skin is deeply tanned making the eyes stand out even more. Amaterasu – is the Japanese Shinto goddess of the sun – she has Japanese features, her face is wide, her hair has ornaments and is adorned. She wears an elaborate Japanese Kimono. Don’t confuse her with White Tara who has finer features. She is a 2nd ray Master. Amen Bey - He is tall, thin, a number two haircut, a thin chiselled face, and amber, almond shaped eyes. He is holding a rapier sword and wears a black waisted coat that swings rather like a twirling dervish coat. He is a 4th ray Master. Anubis – Egyptian god of the underworld - he appears in two ways either as a man with the black head of a jackal – or as a young Egyptian man with no shirt and a white loin cloth. His features are handsome, he has dark hair and dark eyes. He can also give an image or feeling of teeth to announce his presence. Archangel Gabriel - brown hair, light brown eyes, feminine face, wears a white robe. He carries a horn. He is Archangel of the 4th ray. Archangel Michael – black hair, shoulder length, blue eyes and a muscular build. He has white wings. He carries a sword. His hair is not blonde as commonly depicted. Archangel Raphael - he has dark hair, with a fringe. His eyes are a startling mid blue. He wears a short tunic. His wings are pearlescent white. He is bigger than Michael in height and more muscular. He is the Archangel of the 5th ray. Chananda – Asian Indian, dark skinned, short stature, black eyes, cowlick on the front of his hair so hair stands up, barrel chest. Cha Ara - He ascended in the Middle East. His skin is olive, like those from the middle east. His nose is his distinguishable feature in that it droops at the tip, and is wide. His dark hair is about 3 inches all over. He looks about 21. He is full of energy, and rather likes himself. He can be seen wearing Ali Baba type red pants and a very white shirt. Or he can appear in leather jacket and jeans. If he was in body today, he'd be into music and dance. He is fun. A 5th ray Master. Dom Ignacio – he usually wears a black habit, but he does wear red on occasion, especially when healing. He is short. He is balding with black hair. A 3rd ray soul. Elijah – see St John the Baptist. El Morya – he often appears in a black, Prussian blue or white robe. He wears a white turban - sometimes with a bright blue sapphire that is surrounded by black diamonds in the front. He also wears a rectangle shaped sapphire ring, surrounded by black diamonds. His eyes are dark brown/black, but he can appear with blue eyes when he is taking on his Abraham persona. His cheek bones are high, his hair black, he wears a short beard. His energy feels like peace, balance and support. He a revered teacher. Eros - Eros appears as a young man with light brown/dark blond hair/ with a touch of apricot in it. His persona is smiling and friendly. He would be described as attractive. He wears a short white robe. Freya – Norse goddess of love. Her hair is yellow blonder, plaited. She wears a white dress with red ribbons hanging from it. She is a 2nd ray Master. Gautama Buddha – dark hair with red in it. Tall, slight frame. Ganesh – has blonde hair, blue eyes, a handsome face though scarred on one side. He is a 5th ray Master. He can appear with his elephant head persona. Hathor - shoulder length straight black hair, fringe. She wears many items of jewellery - bracelets, collar, hair adornment, rings. Her dress is long and apricot coloured. Not to be confused with Isis and Hathor who look similar. She is a 6th ray Master. Hilarion – he has shoulder length auburn wavy hair, pulled back off his face. He has a wide face and high cheek bones. His face is open and friendly. He wears a forest green long robe, with some orange detail in it. He can appear in an orange robe. Hine-nui-te-po - The Maori goddess of the Underworld. Her hair is white and wild - like the wind is blowing through it, and her skin is dark. Her blue eyes look intense. She is a vast being, and very heart driven. Inanna - the Sumerian goddess of war and love. She is a 4th ray Master. Her aura is pure white with silver rain through the centre. She has long dark hair, fringe (bangs). The front of her hair is loosely caught on each side with gold toggles at chin level. Her skin is olive, her eyes are a stunning green. She wears a gold band around her forehead with a gold drop over the third eye. Around her neck is a gold torque necklace. She is wearing a long white dress, no sleeves. Isis – appears with straight black hair to her shoulder, a fringe across the top of her eyes. She wears a gold floor length dress, with a belt at the waist. Around her neck is an enameled fan shape necklace of blue, green, yellow and red (ruby). She has a refined, ethereal quality to her energy. She is a 6th ray Master. Isolde – wear a garland of flowers in her blonde hair, which has thin plaits falling down her face from her forehead. Jesus – Jesus likes to change his appearance. He can have dark hair and dark eyes – or he can have the light brown hair version. He rarely has a beard; he is either clean shaven or a few days beard stubble. He does have high cheek bones, which can produce a slight concave look to the cheeks. Krishna – has black hair. He is young with refined and delicate features. Not to be confused with Babaji of the Yogananda lineage who is still in body. Kuan-ti – he appears in leather plated warrior dress – not as fierce as Susan’oo. Kuan Yin - Kuan Yin gives the impression of activity. Her long dark hair is pulled back in a waist length plait. She is petite. She is a 3rd ray Master. Kuthumi - his eyes can appear a little crazed and unfocused. Blue eyes, wavy light hair. He has a beard. Lady Nada – Nada is often painted with blonde hair – but her hair is dark. It can appear to be blonde because of the light shining from her. Her last life was in India. She presents with soft feminine Indian features and light olive skin colour. Her eyes are blue. Lao Tze – often wears loose pants and tank top, or a martial arts outfit. He wears his hair tied back and plaited; he is slightly balding on top. Don't confuse him with Lord Lanto who usually wears a skull cap. Lao Tze has bubbling, happy energy. He is a 2nd ray Master. Lord Lanto - If he was to present himself to you, he would appear with Asian features, reminiscent of his last life in China. He wears a Manchurian jacket and pants, with a black skull cap. He calls it modern dress. He wears his hair tied back and long. Lord Ling – is a tiny Asian man, he is very small. One of his previous lives was as Moses. Ma’at – she has shoulder length straight black hair with a fringe. Jeweled ribbons hanging at the front of her hair, she wears white all the time. She is full figured. She is a 3rd ray Master. Maha Chohan – he can appear with and without his turban - he sometimes wears a ruby in the front of the turban - he often produces a rainbow around himself to let you know its him. He has dark hair and dark eyes. He has a slight build. Mary Magdalene - dark hair, round face, wide set eyes. Melchizedek – appears in two forms – one as a young handsome man with long waist length white hair and clean shaven– or in his most common form as an old man with long white hair and a long white beard – he can appear decrepit. He wears a white robe. He is a 1st ray Master though his order (the Melchizedek order) is 7th ray. Mercury - he is a handsome young man with soft blond curls. He is of medium build and it looks like he works out. He wears a short white robe with an opening at the chest. His boots have wings on them. He also has a yellow upside down triangle below his collar bone. Moses – is a big man, he has a barrel chest, caftan type robe with a v neck, shoulder length brown hair, a wiry beard. He ascended as Lord Ling, but often appears in his Moses form. Mother Mary - she has a slight build, petite, ethereal, dark hair. Pallas Athena – she can appear on a white horse. She can wear a long purple cape with a roll collar. Her nose is straight, her hair is long and dark. She often wears her hair with 2 plaits on the side of her head, pulled to the back of her head in a ponytail. Her eyes are violet towards blue. Quite stunning. She is tall - about 6', and her muscles are sculptured. She looks like she could be into body building. She can appear with a short cross like a plus symbol (+) on her forehead. The cross is made of emeralds and amethysts and is edged with diamonds. Paul, the Venetian – is a slight short man, strawberry blonde hair and a trimmed beard. He often wears a velvet suit. Portia (Lady Portia) – she has dark hair, blue eyes, plaited hair at side, veil with a roll that falls from top of head and flows down her back. Ptah – he carries a short sword. He wears black, tight fitting jacket with a long coat. Under the jacket he shows me the wings of the solar disc – a creator god. His aura colours are a soft luminescent pale green. His eyes are almond shape, of aquamarine with a black rim to the iris. He is similar to Amen Bey – but is much shorter and of more solid build. Quetzalcoatl – his aura is of ruby and white. He has dark hair with a red shine to it, shoulder length and parted in the middle. He can appear with bunches of hair to the side of his head. He wears a collar of gold studded with turquoise which covers his shoulders and goes down onto his chest. Ra-mun – he appears as an Egyptian god – he wears false wings, and wears a birds beak on this forehead. He is a 7th ray Master. St Anthony of Padua - He has curly red/copper hair - which in that type of hair which never sits well, and looks a bit disheveled. But he says he wasn't interested in how he looked, so it didn't matter to him. He wears a brown monks robe. From my awareness he walks with those who have shared a past life with him. St Germain – he has a styled mustache and light brown hair. He wears a violet/purple coloured cape. He is well dressed with lace at the neck of his shirt (like in his days at the royal courts) and sometimes a sword on his hip. St John, the Baptist – he wears a mid-blue robe, it has a black and white plaited belt. His hair is brown worn off his face, above his shoulder. His eyebrows are bushy. He has a mole on his left cheek. He can sometimes appear as Elijah, this was the life he made his ascension in – Elijah has a barrel chest, auburn hair and beard. Sanat Kumara – he has a bald head, an open face, and is short in stature. 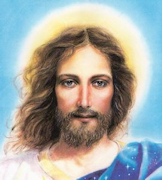 Serapis Bey – he always wears a white robe, sometimes there is a hood. He has black hair. Sitatapatra – she is the goddess of the white parasol. This ancient goddess was the Ascended Master teacher of Gautama Buddha. She wears a red dress and carries a white parasol. Shiva – he has long dark hair, pulled back off his face. His eyes are dark. He wears white loose top and pants. His skin is translucent, his features are refined. His build is slender. Susan'oo – the Japanese summer storm god - he has almond shaped eyes, and winged eyebrows, a feature in themselves. He looks like he is from another planet - his eyes don't quite fit into our parameters. He looks stern and fierce. Thomas Merton – he is short. He wears a monk robe. His hair is dark yet blading. He appears middle aged. Ti – ancient Chinese supreme deity – he wears a red silk mandarin collared robe. His long black hair is plaited very finely and is pulled back of face making his eyes that tilt up. He has refined features. Tsukuyomi - the Japanese Shinto god of the moon . He has a barrel chest. His eye brows are very straight. His hair is black. His face is plump and full. He appears kindly in expression. Vesta – her dark hair is tied back and twisted in the ancient roman fashion. Vishnu – Asian Indian features – his face is broad. He has facial hair around the mouth. He has long dark hair, the top half is pulled up into a top knot, while the bottom half is curling tresses, not quite ringlets. He has thick eye brows. He is bigger build than Shiva. Yogananda – he has wavy dark hair, long, parted in the middle. He appears as his photo. Yemayah - she is an African woman with very dark complexion. Her hair is tight wiry curls. She had huge pendulous breasts. She wears an apron. Silver orbs dangle from her ears. She is a Master of the home, fertility, love and the Divine Mother as pertains to the 4th ray. She is a 4th ray Master. White Tara – she wears gold adornments in her hair which are artfully arranged. Her face is very refined. Don’t confuse her with Amaterasu.